On February 15, 2017, the first session of the INSITER seminar “Contemporary EU-Turkey Relations” took place. 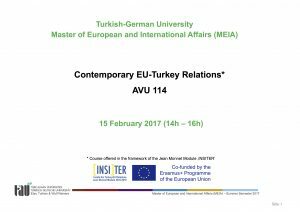 The course was added to the Turkish-German University’s MA programme “European and International Affairs” as a new teaching offer (seminar code ‘AVU114’) in the framework of the INSITER project. The seminar is conducted by the INSITER co-coordinators Asst. Prof. Dr. Ebru Turhan and Asst. Prof. Dr. Wulf Reiners and will take place every Wednesday afternoon. The full seminar syllabus can be found here. On February 2, 2017 the German Academic Exchange Service in Turkey (DAAD Türkiye) has published the first issue 2017 of its widely-distributed newsletter. 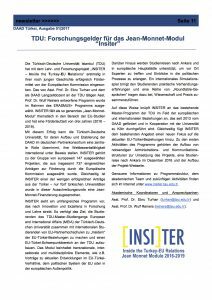 Against the background of the close links between the Turkish-German University and the DAAD, the issue also features a one-page article on INSITER (in German language). The INSITER team welcomes the appearance, which is in line with the project’s dissemination strategy to reach out to the wider public through established communication channels. A download of the complete newsletter (PDF) is available here.